The perceptive remark, often quoted, in his letter of 22nd. March 1889 to his brother Theo from Arles is more precisely, “As far as I can judge I’m not mad, strictly speaking”. Paul Gachet, who ran a Sanatorium and was also a painter, housed Vincent in his establishment at Auvers-sur-Oise near Arles around this time. He encouraged the artist in the Romantic idea, then current that his mental illness and his tormented life were the outward signs of his genius. There were few other means available at the time to assist sufferers. During the latter half of the nineteenth century Sanatoria generally resembled Dr. Downward’s establishment in Armadale, Wilkie Collins’ 1866 novel. Equipped with galvanic apparatus and Systems for electric treatment of nervous disorders, proprietors went to great trouble to avoid their establishments being referred to as madhouses. Given van Gogh’s partiality to strong drink, easy-going woman and, it is believed a careless use of poisonous lead white paint such an establishment did not offer much to prevent the 37 year old van Gogh’s melodramatic death by his own hand in Arles in 1890. Similarly, mercury used to make vermilion, a precious red colour, adopted by artists from early time both European and Chinese was early on similarly known to be highly toxic and dangerous to handle particularly if mined or manipulated as a powder with inadequate protection from breathing in the lethal powder. Prisoners of war, slaves and condemned criminals were chosen to mine it because of its lethal effects on those in close contact with the rock from which it was extracted. Artists like Francisco Goya who, in his late forties began to suffer from obscure illnesses and hearing problems in 1793 were probably suffering the effects of lead poisoning. Ramazzini, the precursor of what eventually developed into the modern discipline of occupational medicine was one of the first scientists to recognise health hazards that workers at what was the dawn of the industrial revolution were exposed to in the factory environment. It included caustic chemicals, unhealthy working practices, poisonous smoke dust from powdered metals, pigments used in the manufacturing processes. He recognised that the occupation of artist, decorator and painter was in itself, and the materials the artist used normally, a hazardous activity. Unfortunately Naples yellow, a delicate and useful fine yellow verging on light ochre was used a lot by early Flemish painters. It was useful for depicting drapery and later in the period of Claude Lorrain, the French landscapist when a light yellow became necessary to accurately render aerial perspective. Forensic analysis of Rembrandt’s paintings show that he used a similar light yellow, lead tin yellow, more often called massicot in northern Europe in Belshazzar's Feast, created between 1636-8 and now in the London National gallery. The pigment was known in Babylonian and ancient Egyptian times but it has been more largely employed in ceramics. Artists’ pigments, those based on lead, are today replaced with safer equivalents and a modern safer versions of Naples yellow can also be found. Artists are more careful today how they handle chemicals and for health and safety reasons smoke less and discourage visitors from smoking while in a painter’s studio. The high health risks associated with ever-present toxic, inflammable and oil, varnish, thinners and solvent-based colours are, generally, familiar to all. Risks are still present particularly those colours that the artist will need use in their powder form. These are common in fresco painting and in ceramics. Finely ground artists pigments made from heavy metals are destructive to the nervous system, by being inhaled when smoking or absorbed through ones skin. The classical killer pigments were already recognised in the early eighteenth century. They were largely based on lead. Lead white, red lead, flake white, lead chrome yellow and orange and Naples yellow (antimony). Rembrandt van Rijn was an artist who conscientiously recorded himself in self portraits from his first tentative steps to establish himself as an independent painter in Leiden, his home town. The ageing Rembrandt surrounded by friends. Sanguine, graphite and watercolour on paper. His paintings of himself continued regularly through his apotheosis as the most sough-after portrait painter for fashionable Amsterdam to his frugal and modest last years lived out in the low-rent Jewish quarter at 4, Breestraat. What shocks you is the contrast between the self-portraits prior to his misfortunes to those paintings done at the end of his life where the rapid degree of his physical degradation is visible. The period covers the downturn of is personal and commercial fortune, bankruptcy and the inventory of his possessions made in 1656, onwards. Rembrandt forms part of a category of painters who towards the latter years of their lives tended to paint with very broad brush strokes. This style is often attributed to fading eyesight and, consequently, an inability to render fine details in paintings. Guilty parties included the long-lived Titian, JMW Turner, Monet, and London, Camden Town school founder painter, Walter Sickert. 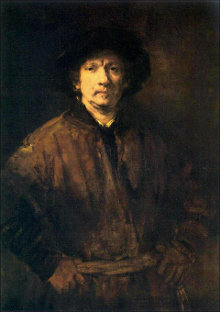 The self-portraits Rembrandt did in the last couple of years of his life sometimes do show him squinting at the spectator albeit not wearing spectacles. 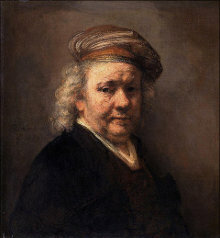 Over time and especially towards the end, Rembrandt’s style loosened and tended to become freer in execution. A similar propensity is noticeable in the later works of Titian especially after 1550. The looseness of style is most obvious in one of his last paintings, the Pieta, now in the Museo dell’accademia in Venice that he had originally intended to decorate his tomb in Santa Maria dei Frari, when he died. Neither of these painters created poorer quality paintings in their old age, rather, they displayed an increased artistic skill using a minimum brushstrokes and smaller range of colours. There is a similar progression in JMW Turner’s paintings, moving from the cartographic style of his early topographic watercolours to the happy confusion of the 1844 canvas in the London National gallery, Rain, Steam and Speed–The Great Western Railway, where aerial perspective, atmospheric effects and splotches of colours give it a wildness and [lack of clarity]. His ground-breaking technique unsettled fellow royal academicians and his contemporaries in general strongly criticised an unortadox method of painting. 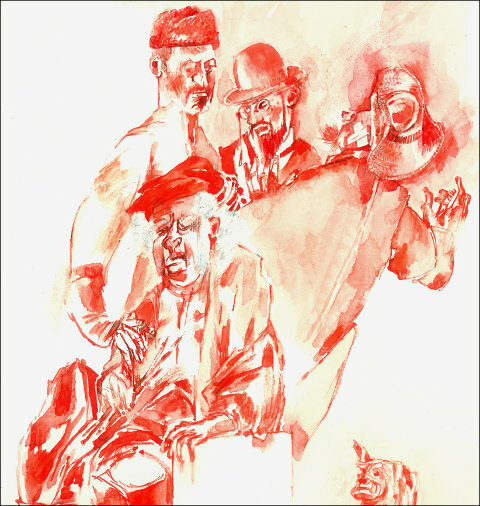 This is without mentioning his sketchbooks, drawings and colour studies that the art world for many decades dismissed as wild jotting. For John Ruskin, Turner’s Boswell, his later works were of biographical value only, and the oil paintings and watercolour jottings done in this free and very calligraphic style, the physical evidence showing how the artist’s health not to mention his sight and his mind had deteriorated severely from 1845 onwards. Physical dangers associated with painting not often mentioned are the hostility of the artists’ ambient particularly for painting working outdoors. It often involves harassment by the locals, intimidation and attempted bribery in order to be allowed to paint some local feature of the landscape. Few artists end up quite like Archimedes, then an old and somewhat absent-minded mathematician killed by Roman soldiers during the sack of the Greek colony of Syracuse in Sicily in 212 BC. The nearest (similarity) was the complete disappearance of some good painters during aerial bombardments of German cities in World War ll. The only traces of their having existed are a few of their paintings housed today in the collections of some Munich banks. William Hogarth, the English eighteenth-century painter found himself in serious physical danger because of his art when, with a group of fellow artists that included Thomas Hudson, he took advantage of the peace treaty of Aix-la-Chapelle to visit Paris. 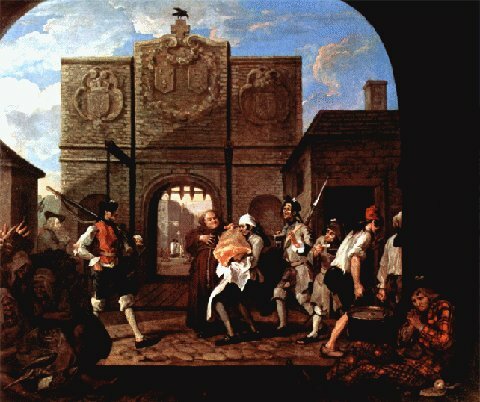 While waiting in Calais for the boat to England on the return journey Hogarth was arrested by the authorities on suspicions of being an English spy. He was observed making drawings, possibly for military purposes, of the harbour gate and the drawbridge. The Governor of Calais, however, realising that he was dealing with a prominent artist eventually released him to continue his home journey. Hogarth, who did not like the French, particularly as their artists were preferred by English art buyers to the home-grown product, in the long run got his revenge to this assault on his dignity. He converted the drawings he had made in Calais immediately on his return home in 1748 into an oil painting showing a side of roast beef being delivered under guard to an English tavern in Calais, the Lion d'Argent, watched enviously by starving French soldiers and a washed up Scottish mercenary. as The Roast Beef of Old England, or The Gate of Calais. Tate Gallery, London. Monet was 65 years old in 1905 when he began to notice he was seeing colours less intensely than previously, a serious problem for an impressionist painter where the eye is everything. Over the next decade it became evident that his failing perception of colours was being caused by cataracts he had contracted in both his eyes. Treatment for cataracts at the time was a very painful and troublesome procedure often with an uncertain outcome. However, at age 82 he finally accepted that there was no alternative and agreed that one of his eyes should be operated on. Following the intervention the artist was obliged to spent weeks immobile in darkness with both eyes covered in bandages. Claude Monet was following in the tradition of those earlier master, from Titian, through Rembrandt, Turner and, later, Walter Sickert who adopted this style in their later years. It is always possible that some of these artist came to terms with the illness Monet suffered and turned it to their advantage, in the process creating works of art that were unique. Maurice Utrillo was the son of the artist Suzanne Valadon then an eighteen-year-old artist's model who posed for Berthe Morisot, Renoir, Toulouse-Lautrec, Puvis de Chavannes, and Degas, in other words, the cream of the Paris artistic milieu of the Belle Époque. He was put out to baby sitters and left largely to his own devices. Utrillo soon showed signs of mental instability, aggravated by alcoholism that he developed as a schoolboy. In the way of children attracted by fragile and feeble companions he was tormented and mobbed by schoolmates. A generally indolent student he nevertheless was a prize-winner in mathematics. There is a tendency to see Utrillo as having endured a deprived and loveless childhood. However Suzanne Valadon’s artistic talent ensured financial prosperity and her marriage to a wealthy stockbroker, Paul Moussis in 1896 when Utrillo was thirteen ensured that he frequented good private Paris schools. His alcoholism and, like van Gogh a partiality for absinth, increased as he reached maturity. Utrillo took up landscape painting in 1904 encouraged by his mother who by now was a successful professional painter. Like van Gogh he regularly spent time in institutions for the mentally ill – his mother, briefly, had him interned in the St. Anne sanatorium at Neuilly. This and alcoholism created roadblocks in his artistic development, nevertheless, his artistic distinctiveness and quality as a painter emerged. The French government officially recognized his importance as an artist, honouring him with the Cross of the Légion d'honneur in 1920. The always mentally fragile Utrillo eventually accumulated a circle of relatives and interested parties who, attracted by his financial success, encouraged him to constantly increase his output of the Montmartre butte quartier of Paris views in which he specialised. These were often inspired or copied from picture postcards showing picturesque scenes of Paris. Inevitably, one thinks back to the later paintings of the Renaissance, artist Pietro Perugino; his final canvases are often pastiches or careless recycling of his earlier works. Similar works by latter-day Utrillos are still available today in the Place du Tertre near the Sacré Cœur. Interestingly, the eventually deterioration of Utrillo's artistic output was caused, not by his mental instability or alcoholism but rather by his internationally acquired fame. Following in the tradition of mental instability, alcoholism and difficult rapports with women of van Gogh and Maurice Utrillo was their near contemporary, Edvard Munch. Born in Norway 1863 into a family itself with a history of mental instability and physical ill health he, on the other hand, was an artist able to channel his fits of depression, neurosis and a more than depressing death-ridden childhood into a form of art universally recognised as the precursor of Expressionism. In his last years the artist lived in constant fear of the Germans, occupying Norway from 1940 to 1945, seizing his paintings. The German National Socialist party had, in 1937, exhibited his paintings in the Degenerate art exhibition at the, Munich Haus der Kunst. He died in Oslo on January 1944 having just turned 80 and, rich and honoured. Munch had the posthumous bad luck that he received an official funeral orchestrated by the German-controlled Quisling puppet-government. One of four versions of his most well known painting, The Scream, a graphic work in wax and chalk pastel on a panel was auctioned off by Sotheby's New York for $119.9 million in May 2012 . Ramazzini , Bernardino, Le malattie dei lavoratori: De morbis artificum diatriba : i testi delle edizioni del 1700 e del 1713.